During the treatment and rehabilitation of tumor patients, the psychological factor plays an active role, and is irreplaceable with other medical treatment methods. The bad mood can reduce the immunity of body, so as to weaken the ability of immune system for identifying and killing the tumor cells; and on the contrary, the optimistic active mood can improve and balance the immunity of body, so as to prevent the incidence of malignant tumors and keep the tumors at a self-limiting state to be finally killed by the immunity of body. Above mechanism is just the substantial effect of psychotherapy. In fact, at whatever disease, the most formidable thing is not from the disease itself, but from the fear and gloom of disease so as to completely lose the courage of survival. During the treatment and rehabilitation of patients, the medical persons pay a close attention to their psychological response and mood fluctuation, and then pertinently make the psychological catharsis and relieve the bad mood. The patients are instructed on the following facts: the worry, sadness or depression will not benefit the treatment, but only exacerbate the illness. On the contrary, it is very beneficial for stabilizing/improving the illness, improving the survival quality and prolonging the survival to take an active initiative calm attitude, maintain a good mental state as far as possible, keep a firm faith of cancer defeat and coordinate with the doctors in treatment. The Zhenguo tumor rehabilitation culture is main carrier of psychotherapy. 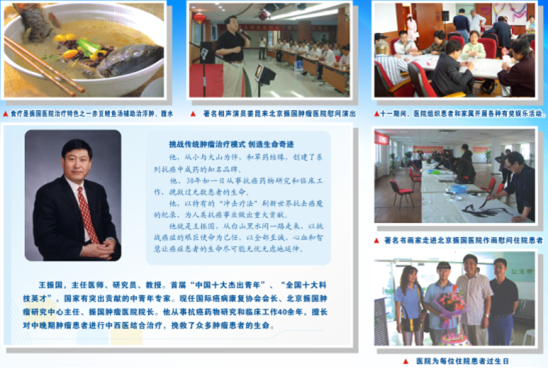 As the founder and guide of this rehabilitation culture, Prof. Wang Zhenguo forms a unique culture of tumor rehabilitation by perfectly combing the modern medical technology with his concepts of tumor rehabilitation and experience of clinical treatment accumulated in the past over 30 years. In this rehabilitation culture, through a series of activities beneficial for rehabilitation, the effect of pressure release, mood rejoicing and life enrichment are achieved, so as to improve the survival quality of patients and prolong their life. (1) Weekly recreation (e.g. singing and dancing) for inpatients to release the psychological pressure and rehabilitate in a happy mood. (2) Monthly communication on the rehabilitation concepts to encourage the will, summarize the experience and thus avoid the detour. (3) Heart-to-heart talk between the doctors and patients to communicate in time and in an open way, make the psychological catharsis, realize a harmony and mutual trust and coordinate the treatment with a joyful mood. (4) Rehabilitation lectures (e.g. new therapies for recurrence/metastasis restraint and dietotherapy) to improve the efficacy through the new therapies. (5) Rehabilitation travel for our nationwide patients and diversified rehabilitation cultural activities for our inpatients (e.g. outgoing in early spring, moon watching, birthday party, social gathering, poem recitation, speech contest and chess match) to make a favorable influence on the character, cherish the life and perceive the life happiness. Our staffs and medical persons actively encourage the patients to participate in the rehabilitation cultural activities, so as to defeat the cancer through the concerted effort of doctors and patients.